These people who are making this world a better place include those who are off the silver screen and performing stage, but are remarkable human beings. For a moment, I felt star-struck, as Alicia Keys entered the room bustling with journalists from world over. We, a varied group of journalists, had been invited by the United Nations Foundation (UNF) to report on and learn from the experience of being in the United Nations (UN) Headquarters in New York for the UN General Assembly and the Climate Summit 2014. All of us are fans of the many celebrities that we saw all around us in those few days. But once done with the initial gushing and surreal feeling of being in the presence of “stars”, we not only saw these goodwill ambassadors in a different light, but rediscovered them as bigger celebrities than we thought. Anyone who has been inside the UN knows that the gray concrete flooring and white lights give it a formidable and cold ambiance. The warmth, then, came through these stars and the work they are doing. These people who are making this world a better place include those who are off the silver screen and performing stage, but are remarkable human beings. Like celebrated humanitarian Graca Machel, the widow of Nelson Mandela, who punctured the bubble of world leaders by criticising their speeches over the issue of climate change. Or like the lesser known unsung female hero from Papua New Guinea, Ursula Rakova, who has pioneered an environmental movement that will save lives of generations. With an overgrown beard, a caveman look, DiCaprio looked different. But for once, it was not about his looks, his acting or his personal life. While friends sent messages asking why he had the bearded look, all I could hear was words that will go towards changing the life of millions. “I stand before you not as an expert but as a concerned citizen, one of the 400,000 people who marched in the streets of New York on Sunday, and the billions of others around the world who want to solve our climate crisis”. DiCaprio was referring to the People’s Climate March in Manhattan that brought attention to the issue like never before. “I play fictitious characters often solving fictitious problems. I believe that mankind has looked at climate change in that same way,” said DiCaprio, ruffling just the right feathers. As she sang the song We are here… for all of us, the theme song for her campaign, sniffs from the audience were audible. She told the crowd to hold the neighbour’s hand, a human chain, and we all did, experiencing a powerful moment. “The song We are here is born from a very special place. The backdrop is everything that is going on in the world. There has been one issue after another: Syria, Nigeria, Gaza, Israel, Ferguson. I wanted to do something but did not know what. I used to have anxiety hearing about all of this. I would literally ache. There was a lot of what if, could we, would we! This work and this song is a dream come true,” said a visibly pregnant and highly motivated Keys. Here, Keys pledged a million dollars to her We Are Here Movement at the fifth annual Social Good Summit. This Summit is defined as a convening of world leaders, media and technology leaders, activists working on grassroots, UN experts and voices from around the globe. We always knew that this young woman who played the genius Hermione Granger in the Harry Potter series is brilliant. But her masterstroke came as she redefined feminism as the UN Female Goodwill Ambassador. Watson extended an invitation to the men of the world to fight sexism. She spoke at the launch of the #HeForShe campaign which is a solidarity movement for gender equality. “Men, I would like to take this opportunity to extend you a formal invitation,” she said. “For the record, feminism by definition is: ‘The belief that men and women should have equal rights and opportunities. It is the theory of the political, economic and social equality of the sexes,’” said the remarkable young woman. Watson has become, through this, a champion not just for women’s rights, but also a hero of many men world over, who agree with her that equal opportunities between the sexes cannot come around if only half of humanity is invited to participate in the conversation. Watson touched upon how feminism is often misconceived and associated with “man-hating”. 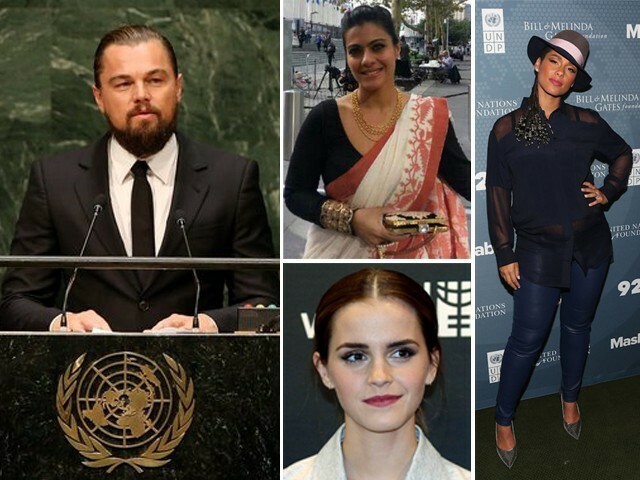 Championing the cause of maternal and child health, Kajol graced the 69th annual UN General Assembly summit. She has been part of an active hand-washing campaign, Help A Child Reach Five, that aims at improving health of children and guarding them against illness and death in infancy and the age group under five years. Kajol, in a tech savvy manner, used Twitter well to get the message of propagating this life-saving habit across. Humble, sober and focused, Linkin Park singers Chester Bennington and Mike Shinoda are very serious about making the world a better place, and they mean it. At the Climate Summit, they renewed their continued support for sustainable energy. “Our message is very clear. Be bold and strong. We are counting on you guys to make the change. A fan is not someone who just thinks you are hot. It is someone whose trust you have won,” said Bennigton and Shinoda. Their organisation Music for Relief does miscellaneous work for disaster relief and renewable energy causes. Posted in Human Rights and tagged Alicia Keys, Climate change, Emma Watson, He For She, Linkin Park, UNF, UNFPA, United Nations, United Nations. UNGA2014, We are here. Bookmark the permalink.